The association between blood pressure (BP) levels and increased risk for cardiovascular (CV) events is a continuum. The negative impact of elevated BP on patient outcomes is evident in the prehypertensive state which includes both subjects with normal (120–129/80–84 mmHg) and high-normal (130–139/85–89 mmHg) BP. The underlying pathophysiology linking prehypertension to poor CV prognosis is complex and not entirely understood. 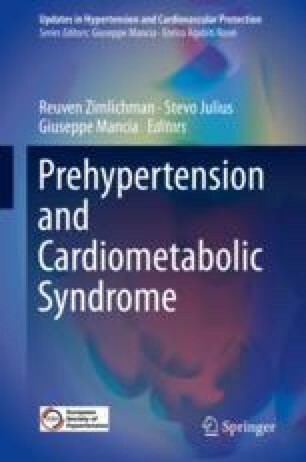 Available evidence indicates that particular consideration should be given to subjects in the upper end of BP values (stage 2 prehypertension), in whom neurohumoral activation with heightened activity of the sympathetic nervous system (SNS) and renin-angiotensin system (RAS), along with the presence of CV risk factors, play a causative role in BP initiation, adverse complications, and transition to hypertension. Therapy with candesartan found an absolute reduction in new-onset hypertension in subjects with high-normal BP, possibly through an inhibition of relevant neurohormonal pathways acting on the brain RAS and sympathetic outflow. However, until randomized clinical trials prove benefits of antihypertensive therapy on hard CV endpoints in stage 2 prehypertension, intensive lifestyle interventions should be widely implemented to prevent the incidence of hypertension. Conflict of Interest disclosures: none. Each author does not have any personal or financial relationships that have any potential to inappropriately influence the manuscript; there are no financial or other potential conflicts of interest including involvement with any organization with a direct financial, intellectual, or other interest in the manuscript. In addition there are no grants and sources of financial support related to the topic of the manuscript. The authors of this manuscript have certified that they comply with the Principles of Ethical Publishing.